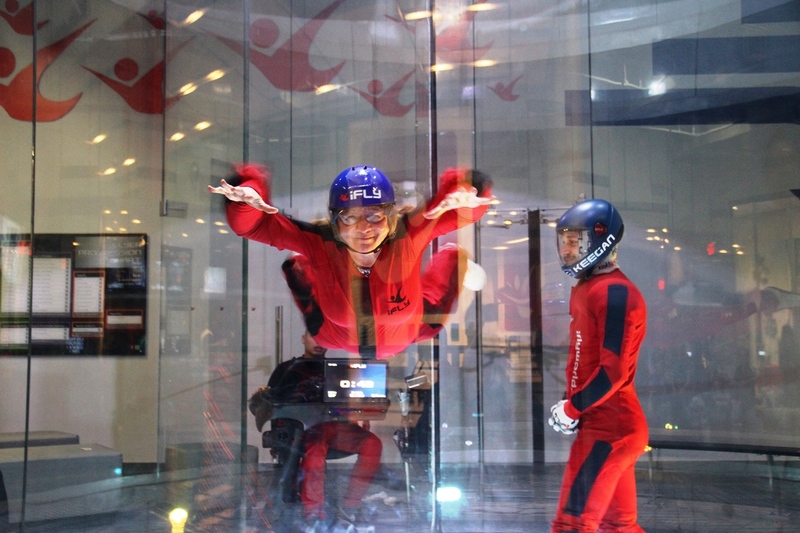 Indoor skydiving at iFly Chicago in Rosemont. They say the sensation is what freefalling is like. It was an awesome experience, but regardless, I hope I don’t ever experience real freefalling. Beloit International Film Festival (BIFF). We never even thought about going to a film festival before, thinking we wouldn’t enjoy it. It turns out we loved BIFF. Yes, we saw a few odd films, but most were entertaining, captivating and/or thought provoking. The venues were great, too. A couple of films we saw were held in an auditorium or other normal film venue, but most were makeshift theaters in local cafes, markets and restaurants. A highlight was the Grease sing-a-long in a local movie theater, co-hosted by Randal Kleiser, director of the movie, and complete with props we were handed when we entered. We discovered that Colon, Michigan, is known as the magic capital of the world. Who knew? 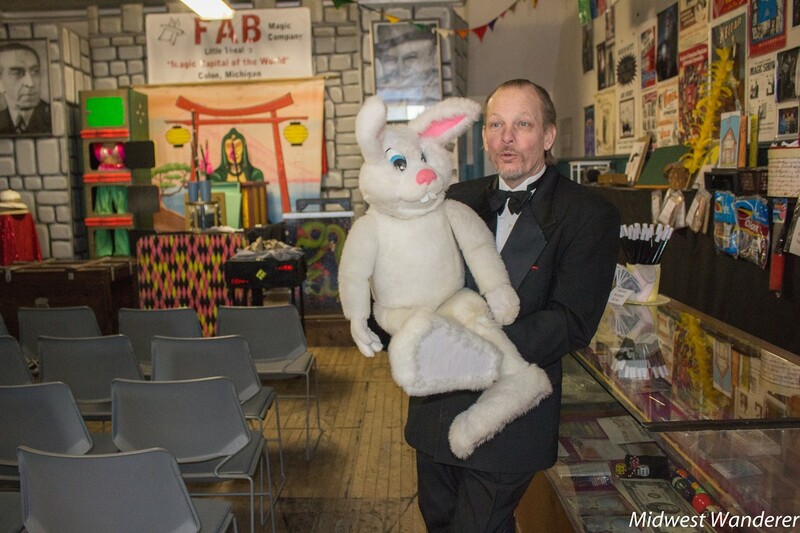 We were treated to a private magic and ventriloquist show and toured the area, including a cemetery where many magicians are laid to rest. On our way to Phoenix for a conference in March we drove several lengths of Route 66. We stayed in a few original Route 66 motels, including the Wigwam Motel in Holbrook, Arizona. If you are a regular Midwest Wanderer reader, you may know that I love caves. In Springfield, Missouri, we visited Fantastic Caverns, the only ride-through cave in the United States, no walking or climbing required, just sit and enjoy the beauty beneath the earth. 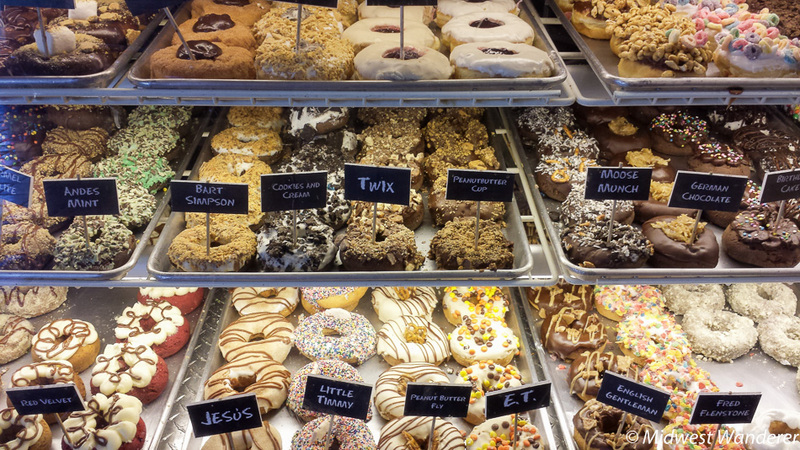 On a second visit to Springfield, Missouri, we visited Relics, the state’s largest antique mall and indulged in the wackiest donuts ever at Hurts Donuts. Mine was drenched in maple frosting and bacon. We visited Springfield, Illinois, twice in 2015, too. We had the privilege of attending the Abraham Lincoln funeral reenactment in honor of the 150th anniversary in May. Later in the summer we returned for the Illinois State Fair, the first state fair either of us ever experienced. We took our longest trip ever, almost three weeks, in late May and early June. We drove through states we had never been to, Wyoming and Utah, explored the Mammoth Lakes area of California, then drove to Monterey for our niece’s wedding. 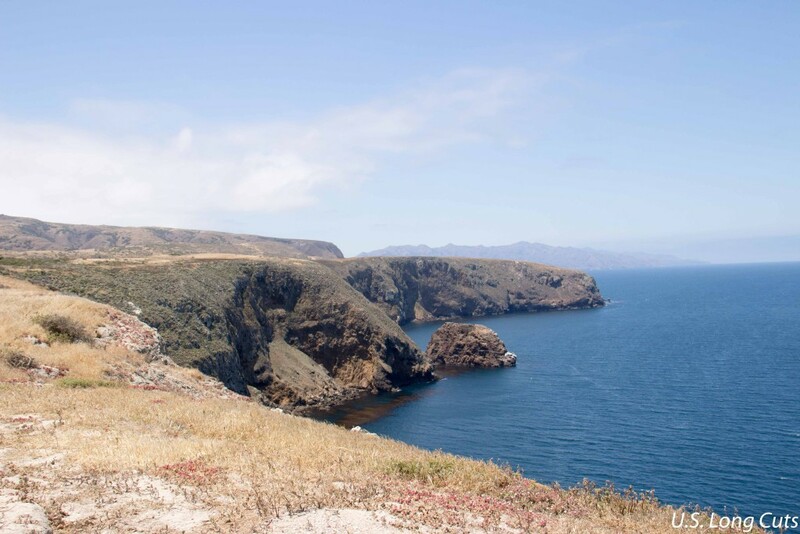 Afterward we explored the Channel Islands National Park and then drove more of Route 66 on our return trip. I visited Iowa three times in 2015, twice alone and once with Skip. On the first trip, to the southeastern part of the state, one of our stops was Snake Alley, the crookedest street in the country. My blog post about it turned out to be, by far, my biggest hit of the year. My second Iowa trip was a culinary tour of the northeast part of the state. We explored organic farms, ate in restaurants that served food from those farms, and ate and ate and ate. Our visit to Franklin County in north central Iowa a week later was an agricultural tour, including a ride in a combine as it was harvesting corn. In July we stayed close to home, exploring Lake County, Indiana, where we had more “who knew?” moments. 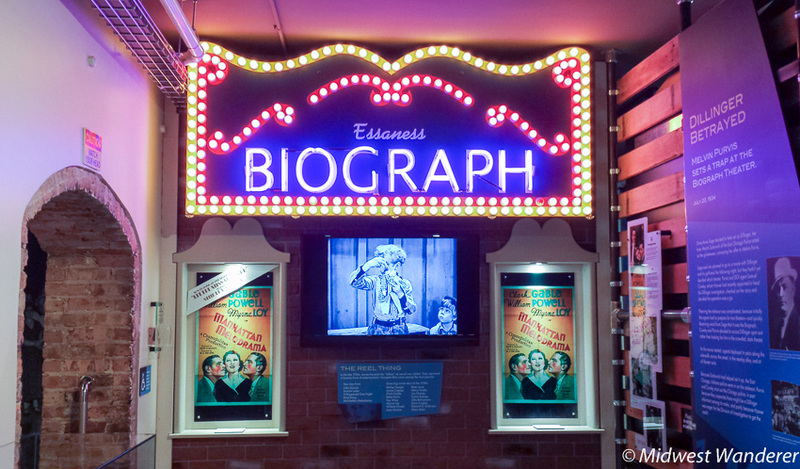 We toured a shrimp farm (yes, in the Midwest), a bison farm, and the new John Dillinger museum. In October we attended our first TBEX (Travel Blog Exchange) conference, where we met up with some of our blogger friends, attended educational sessions and took an airboat trip in the Everglades. We saw alligators for the first time not in captivity. November took us to Milwaukee. 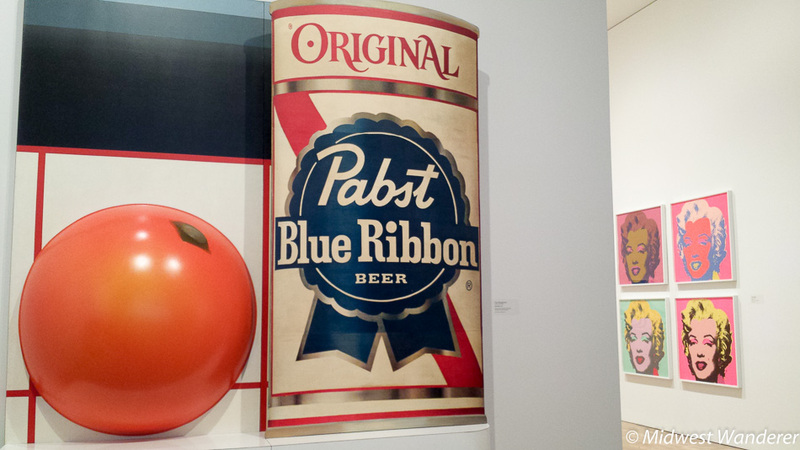 Besides the reopening of the Milwaukee Art Museum Collection Galleries, we explored the Historic Pabst Brewery area and stayed at the historic Pfister Hotel. 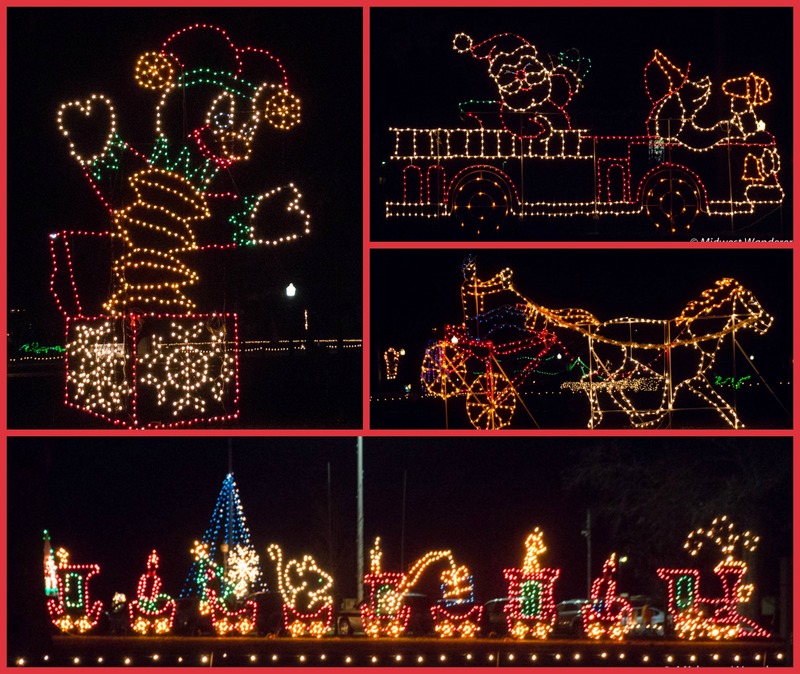 Every Christmas season we close out the year with at least one holiday lights event. This year it was in Du Quoin, Illinois, which included a big indoor fair, as well. Since starting Midwest Wanderer over two-and-a-half years ago, we have explored some fascinating places and have met many wonderful people. We’re looking forward to more adventures in the Midwest and beyond in 2016. What are your travel plans for 2016? Let us know in the Comments section below. Thank you for reading Midwest Wanderer. Don’t miss a post. Enter your e-mail address below and click Subscribe to be notified whenever I publish another post. Subscription is FREE. Love all your photos – especially the Hurts Donuts, and the Abraham Lincoln Funeral Reenactment is certainly an interesting thing to experience! Thank you! 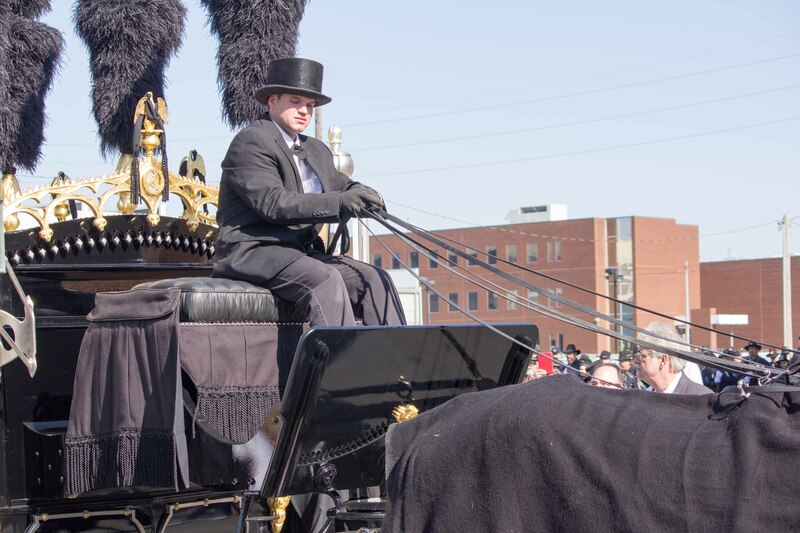 The Lincoln Funeral Reenactment was quite an experience. A few months later I had the opportunity to tour the replica funeral train car in Northwest Indiana.